My love affair with hats started when my mom dressed me in a little pink cowboy hat for my third birthday pony party and has yet to cease. 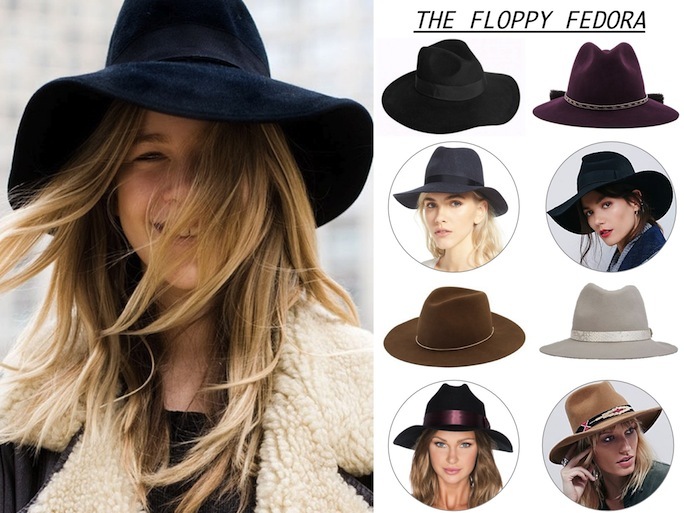 So of course, as I was last year, I can't wait to wear one of fall's must have accessories- a floppy brimmed fedora. Choose a light wool version to camouflage a bad hair day or bring on the drama with a wide brim fedora. As a general rule the more floppy brim the hat, the more casual and a bit bohemian it seems. To play on the dramatic menswear trend this fall a wide brim with some structure but a hint of give is the hat to have. When it comes to nonchalant floppy brim fedoras, Rag & Bone is the most recognizable brand, and has been rocked by celebrities including Rosie Huntington and Emma Stone. I love my Janessa Leone floppy fedora and wear it on a regular basis. and for a budget buy Brixton fedoras are a must shop.